Way back when I bought my Blendtec Blender I had grandiose notions that I would be making all of my own nut milks, soups, dips, etc in my fancy new machine. Aside from one almond milk attempt (which was great, but for some reason I never posted about it? ), it has been almost exclusively a very good smoothie machine. 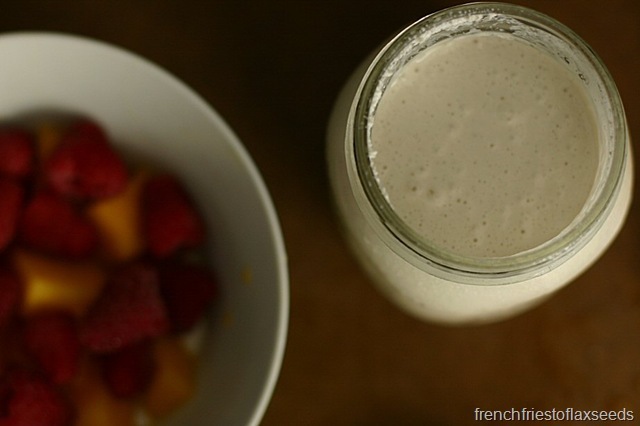 This isn’t a bad thing – I can add pretty much anything to a smoothie and it will blend into the perfect texture. But I really feel I need to explore the possibilities of my coveted kitchen appliance more. 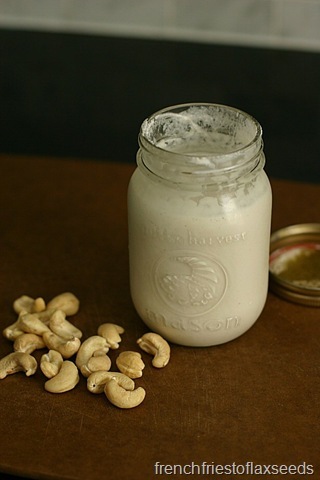 The other day I was rummaging through the cupboard, and found a bag of raw cashews that I had probably bought with the intent on making cashew milk or something else in the Blendtec. I decided to throw a cup into the fridge in some water to soak, not knowing what exactly I was going to do with them. I remembered (a day or two later) that they were in there, and figured I better come up with something. My mind went to this amazingly delicious cashew whipped cream we made for the Harvest Community Dinner we hosted at UBC (that was almost 2 years ago now!) We had made it as a substitute for whipped cream for our vegan diners, and it was a hit with vegans and non-vegans alike. Unfortunately, I don’t have the recipe anymore. I wasn’t really in the mood for a full blown whipped cream, nor did I just want to make cashew milk. So I did a little digging on the internet, and decided to try my hand at cashew cream. I decided to make mine on the sweet side, to pair with all of the amazing summer fruit I have on hand. A little vanilla, maple syrup, and a pinch of salt was all I needed to make my sweet cashew cream. Such a nice accompaniment to a bowl full of raspberries and mango. And in case you don’t believe just how thick and cream like it really is – look at how it clings and coats the fruit. Now I just need to get my hands on an ice cream maker (Dear wonderful boyfriend – my birthday is less than a month away. Hint hint!). You only need 3 ingredients and a blender or food processor to make this amazingly simple and totally delicious vegan cashew cream. Use it anywhere you would use regular dairy cream – because it has a high fat content, it will reduce and make delicious cream sauces. It also freezes well, and would make a great base for a vegan ice cream. 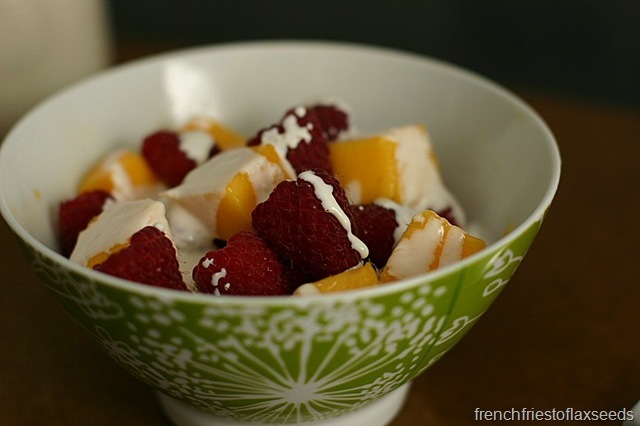 Or serve it on top of your favourite fruit for a refreshing breakfast, snack, or dessert. 1. 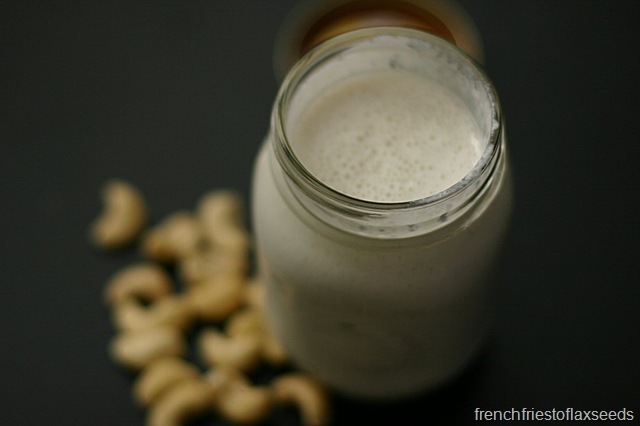 Soak cashews in water overnight. Try to not forget about them in your fridge for days (I know from experience). Drain. 2. 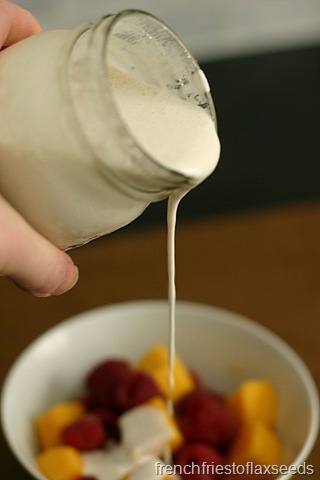 In a high powered blender, add cashews and enough water to just cover them. Also add salt, and any other flavourings you wish. Blend on high for 1 minute, until you have a very smooth cream. Keeps refrigerated for 3 – 4 days, or in the freezer for 1 month. Note: There shouldn’t be any grittiness. If you use a regular blender or food processor, you may need to double the blending time, and even strain the cream through a fine mesh sieve. 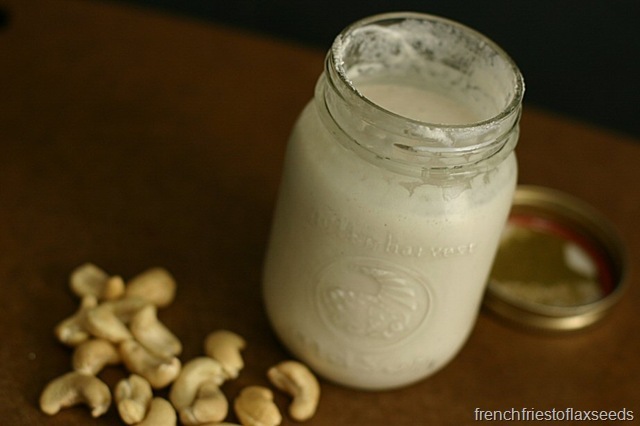 So…what would you make with this cashew cream? Any recipes to share? Any thoughts on how to convince my boyfriend to get me that ice cream maker ;)? I’m actually making a cashew “ricotta” for a raw lasagna (with zucchini) tomorrow. The recipe is slightly different, but I hope it turns out! PS. I tried your raspberry and chia pudding parfait on Sunday. Amazing! This isn’t that exact recipe – I’m pretty sure that one involved coconut oil as well, and probably less water. But it was oh so good to eat by the spoonful, that’s for sure!